This postcard from the early 1900s was produced at a time when Asylums were a popular subject. 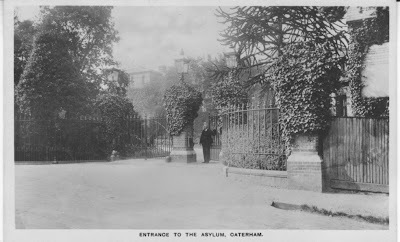 Before closure in the 1980s it was called St Lawrence's Hospital, rather than Caterham Asylum. It was a large Victorian asylum put up to look after people from London with learning difficulties - located quite some way from any family who might want to visit. It was one of many London overspill asylums in leafy Surrey, and was an H shape with a female side, a male side and a connecting corridor with many services filling in the central area: like kitchens, recreation hall, swimming pool, laundrey, tailor etc. . Some old asylums had architectural value, but St Lawrences was cheap and functional and so was just knocked down before being turned into a housing estate in the early 1990s.